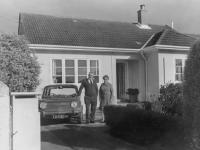 On September 18, 1937 New Zealand's first state house was opened at 12 Fife Lane, Miramar. The McGregor family were the first family to live in the house. Russell McGregor was born in the house and he remembers the tram, playing at Crawford Green and the smell of burning coal from the Miramar Gasworks. The McGregor family bought the house from the state and lived there for about 50 years. The house was bought from the state and when Mr McGregor's grandfather died in 1980 the state bought it back from them. The house is made of heart rimu, a tiled roof and bricks. A state house is a house that was owned by the government and rented out to people at a low price.